After Wednesday’s Walkathon, again I say, more bubbles! More drums! And more holding hands! I’m still basking in the goodness of this annual event. Like the Walkathon, wouldn’t the journey of life be even sweeter with more bubbles, drums, and holding hands? And I love what this week’s picture represents to me at Rose Park. I see connectedness, belonging, acceptance, and love. 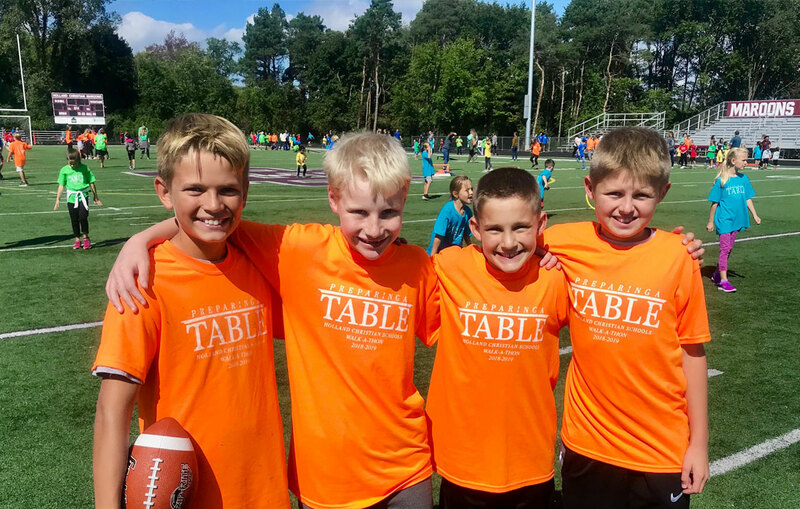 I love that these 5th grade boys could walk together, play some football catch together, and so readily throw their arms around each other’s shoulders when asked to take their picture. They each are unique young men with unique gifts and strengths, as well as challenges. Yet, together we are more whole, more complete than when on our own. There is a wonderful spirit at Holland Christian Schools that relishes celebration, and connectedness. I deeply desire this for all of us at Rose Park. We had such a beautiful day together Wednesday with all of the elementary students, staff, and many of our parents joining us for this year’s event. I love joining together all of our elementary students and staff for the Walkathon. We are part of a great Holland Christian community even though we gather each day in three elementary buildings on two sides of town. What a joy to experience our oneness in this unique way. We want to extend a huge thanks to our parent planners and volunteers who made this year’s Walkathon another sweet experience. Thank you, of course, too, to all parents, grandparents, family members, local businesses, and all who contributed to our students and supported the Walkathon financially. Over $58,000 was raised from all three buildings! Bless God for such a gracious and generous response! Among other things, these resources will support some additional playground and outdoor learning space enhancements, as well as other initiatives in our classrooms and buildings for all of our students and staff. Once again, thank you! Tuition invoices will be arriving in your mailbox mid to late September for the 2018-2019 school year. If you expect to see an invoice and have not received one by October 5 please let our office know by calling 616-820-2805 or email Terry VanderKolk at tvanderkolk@hollandchristian.org. If you have any questions regarding your invoice once you receive it, please direct your questions also to Terry and she will be able to help you out. Do you or someone you know have an interesting hobby, specialized knowledge, or creative idea to share with elementary students? Holland Christian is looking to match you with interested students in our After school Community Enrichment program. Please share your ideas for teaching an ACE class with our coordinator, Sue Vos (svos@hollandchristian.org). Grandparents day is coming, Thursday October 4, 2018! Preschoolers will have a chance to share their classrooms with their grandparent in the morning. K-6 will share their classrooms in the afternoon. Remember, 5/6 can invite grandparents to join them for a special lunch on this day. An informational flyer went home with specific details. As a reminder, K-6 students may be excused to go home with Grandparents or Grand friends at the end of the school day, provided their teacher has received permission from their parents. Thursday, October 4 will surely be a wonderful time of fellowship, a beautiful program put on by our kiddos, and some delicious treats and refreshments! However, we need your help! We will need a variety of goodies to offer our guests, so please sign up for what you can! Anything you commit to bringing will need to be dropped off to the front office by 8:30am on October 4. Either home-made or store bought goodies are welcome and appreciated! Please use this link to sign up. Thank you! Register today! https://www.hollandchristian.org/tuition-grant-fund/ tuition-grant-fund-auction- registration/ . While we always accept late RSVP’s because we don’t want anyone to miss out on the fun, it is so much easier for us to prepare the table for you if we know you’re coming by today. And trust us, you want us to include you in our catering count for Alpenrose! As always, our menu includes prime rib, but this year’s twists and additions are so tantalizing you might have your plate full before you even get to the carving station. You’ll have time to enjoy coffee and a delicious dessert after dinner, during the live auction. We are so looking forward to sharing this night with you! If you have any questions about the event, please contact Leanne Halma, Anne Bushouse or Anita Mulder. 6th graders have more opportunities to participate in Middle School athletics. Our Winter 1 season begins 10/15/18. Please click on this link to read more about the opportunities. 8:15-9:05 in the library on Fridays that we have school in session. Hope to see YOU soon! Hope College is offering a free football game this Saturday, September 29. Click here for more details! There is a wonderful opportunity for children ages 9-12 to learn to play the harp. Our Holland Christian High School Orchestra has a need for a harpist in the future… this would be a great way to get started. Click on this link for more information! NOTICE : There was a change in the start date and meeting time! This group will meet on Thursdays, September 28 – November 9, from 3:30PM-5:00PM. 5th and 6th grade girls! Would you like to play volleyball for a local League? This is a travel Volleyball league that will compete against area communities. Practices are on Tuesdays and Thursdays. Saturday games will require some travel to local communities (Hamilton, Zeeland, Fennville) This League runs from Saturday, October 22 – December 8, 2018. Fees: $35 Resident~$50 Non-Resident if you register by 9/24/2018. Registration between 9/25/2018-10/8/2018 will be Fees: $40 Resident~$55 Non-Resident. After 10/8/2018 registration increases to Fees: $50 Resident~$65 Non-Resident; pending availability. Go to Holland Recreation website to Register for the Lakeshore Volleyball League! All skill levels are welcome! Holland Christian High School Athletes and Coaches will be leading these three sessions and leagues. For more information click here. To register for HC Clinics and Leagues click here. Holland Hospital is excited to invite all students, families, friends and faculty to participate in the 2018 School Nurse 5K Run/Walk on Thursday, October 4 at Holland High School. The School Nurse 5K Run/Walk is a fun, family-style event to benefit the hospital’s School Nursing Program. This non-competitive event is a perfect way for students and families to enjoy an evening of activity together. New this year, starting at 4:30 PM join us for FREE food and entertainment! The best part – students can enter the Run/Walk for FREE by completing ten 30-minute physical fitness activities of their choice prior to the event! Fitness Tracker envelopes will be available to students at the beginning of the school year in the main office. The Fitness Tracker can also be found online at hollandhospital.org/schoolnurs e5k Children under 12 must be accompanied by an adult. Fitness Tracker envelopes can be mailed in or turned in to the school’s main office. Register by September 26 to guarantee a shirt (we order extras). Walks Ins are welcome as well. Run starts at 6:00 pm. Prizes will be awarded to the most spirited participants (think most colorful, silliest socks, crazy hair, anything)! Students run for free when they download and complete this fitness tracker: hollandhospital.org/schoolnurse5k . Friday, October 5 at 7:00PM is the 36th annual Parade of Fire Trucks in downtown Holland.